“You won’t regret this,” repeated in Bomani’s head over and over again as he made the distance from parked car to back alley door. The bulk of the bass speaker bounced with his pace, and he shifted its weight as he neared the coffee bar’s back entrance. Cradling the speaker between his chest and left arm, Bomani used his right arm to grab the door. He pulled hard, and the heavy gray-metal door swung far enough that he got his back to it before it slammed shut again. The door hit hard, square on his back, but this was his last trip, so Bomani didn’t mind. “You won’t regret this,” continued echoing in Bomani’s head as he untangled the great length of black power cords and audio cables. Every minute or two, he looked over his shoulder expecting Kenny to be there. It was Kenny’s coffee bar, for heaven’s sake, shouldn’t he be there? What the hell. Bomani would thank him later. Minerva was steeling her nerve to mention the subject when Kenny emerged from the coffee bar’s kitchen, brushing off flour from his hands. “You been back there all along?” Bomani asked. “Well, then, get your stuff together, and show me I don’t have to.” Kenny patted Bomani on the back and pointed him to his work. “Not really,” Kenny said, but he stayed and chatted nonetheless. While Bomani configured the speakers, Minerva was filled in on everything there was to know about Kenny’s cat, Kenny’s motorcycle, and Kenny’s bar. He went on at length about the great location: right in the heart of oldtown-downtown, next to Powell’s City of Books, the historic district — where all those used CD stores used to be when they were all kids. “The 1960s, specifically. And, yes, nothing else,” Minerva smiled. “Thanks. That’s sweet.” Minerva got her bag out of her little, red hovercar and then came back to settle into Bomani’s plushy, older, hybrid SUV. Bomani pulled the car out of the parking lot and aimed for the freeway. A few turns and a sparkling view of the city opened up around them. High above the Willamette river on an ancient four lane bridge, Bomani’s SUV was shooting like an arrow for home. Minerva must have fallen asleep before they reached home, because she woke up to the car pulling into the driveway. Bomani helped her out of the car, and she leaned against him walking in. In her tired state, wavy hair loose about her pajama-clad shoulders, Minerva simply looked confused. “For making our anniversary more special,” Bomani clarified. “And tomorrow will be too hurried. Give me one minute. Then you can think about it?” He touched her hair, put his hand under her chin, tilting her face until she was looking into his. She smiled. “But, I wouldn’t understand how important it was…” Minerva could care less about live music for its own sake at this point in her life, but she longed to see her husband fulfill his dream. No more words passed on the subject that night, but Minerva found herself, the next day, doing exactly what Bomani asked. She kept thinking about it. As soon as she’d get the idea out of her mind, a co-worker would come by, and Minerva would plug Bomani’s band. She wanted a packed audience for him on Saturday… But the reminder would lead her thoughts right back to Bomani’s crazy memory-drug scheme. So, Minerva gave in and considered the idea. She shut the door to her office and streamed a guilty pleasure over her computer speakers: Deryl Noia, her first album. The cool, strong voice filled her. Deryl Noia had the voice Minerva wished she had. How could Bomani want to forget this? When music touches you, why would you erase it? Doses were weaker now. All the health industries swore up and down, crossed their hearts, and the like that you couldn’t overdose on the over the counter version. The prescription stuff was stronger, but doctors didn’t hand it out easily. Still, erasing part of your mind didn’t seem much like recreation to her. And, suddenly, the album ended. Damn, Minerva hadn’t heard a note of it since the first track. She’d been too busy thinking. So, she started it again. This time on loop. And, this time, she would really concentrate on the music. Except, she couldn’t. Every time, by the middle of the second track, her mind started to wander. It wasn’t the fault of the music. She knew that. She’d loved Deryl Noia’s self-titled album since it first came out. She’d just heard it so many times… Her mind was used to it. And that was Bomani’s point. That’s why he took those pills and forgot all his favorite music. Last week it was the Beatles’ Abbey Road. He popped a pill, and the whole thing was new again. He’d been in raptures, as always: how amazing the Beatles were, those guitars, that beat, how could anyone not love them? Easy. Most people had heard each and every Beatles’ tune a million times. Not Bomani. He wouldn’t let that happen. Minerva smiled to herself. It was the same enthusiasm that first ensnared her: he was a true musician. Even now, with Ent-Ind monopolizing the industry, Bomani wouldn’t sell out to them. Sure, in his day job, he was an Ent-Ind engineer. But, he wouldn’t take out a contract for his voice or guitar. They couldn’t touch his art. On the way home, Minerva took a detour through the local pharmacy. There it was. A colorful box labeled Mnerozia held the foil and plastic bubble packs with those familiar little pills. Minerva picked it up and imagined herself taking one. She must have stood there a long time, because a store clerk came over to check on her. “Do you know anything about this?” Minerva held the Mnerozia out, and the clerk peered at the box to read the label. “How does it work?” Minerva felt very small, asking these questions after watching her husband take the pills for years. Yet, somehow, the idea of taking it herself was very different. “Mnerozia weakens connections in your brain and blocks the formation of new connections. So, say I want to see Terminator 5 again. I turn on the movie and pop a pill. While I’m watching the movie, I’ll start forgetting its connection to other events in my life. For instance, if I want to remember the first time I took a girl to a movie, I’ll be able to remember the girl, holding her hand during the movie, the whole bit — except, I won’t remember that the movie was Terminator 5. Suddenly Minerva held the box as though she thought it might bite her. “Sure,” she said. If she just opened the medicine cabinet at home, Minerva would find a whole stockpile of Mnerozia. However, she felt that buying the box herself would help steel her nerves for trying it. “Romantic,” the clerk said in a way that made Minerva feel certain he didn’t have a girlfriend. “Perfect,” Minerva thought. “Thanks.” Then she went home to try it. Back at Groundswell Coffee, Bomani was helping Damon power-screw the bolts into place on their stage. The two of them were working each other into frenzied daydreams of the deafening applause and uproarious cries of “encore!” their band would face come Saturday night. Then, Bomani’s phone rang. “That makes sense.” Bomani remembered how excited she was whenever a Clashing Greens album used to come out. “Wait… You took it? You took the pill? Why didn’t you wait for me? I’d have been there to take care of you through it…” He knew how much Mnerozia scared her. “Yes.” Her voice was small. He pictured the night Swansong II came out. They sat on their bed, listening to it in the dark. Minerva insisted on listening straight through. She hadn’t said a word. And, when it was over, her face was stiff. She wouldn’t talk about it, except to say, “Let’s listen to it again.” By the end of the week, she sang along with every song, listening to it while they cooked. He’d hardly been able to play a song of his music for months. 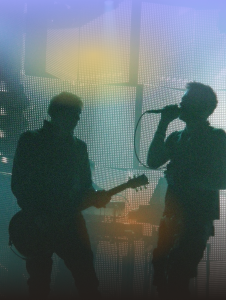 There was a pause, and, then, “Keep working on the stage with Damon. I’ll be okay. What would I do without you?” Bomani grinned, but Minerva couldn’t see it over their cheap old-fashioned phones. When he got home she looked fine, but he gave her the hug that had been waiting inside him anyway. “You doin’ better?” he asked. She stepped back, keeping her hands in his, and looked at him. As she started to speak, he put his finger to her lips. Bomani covered the back of her head with his broad, brown hand, pressing down the wavy hair. “That’s why it’ll be okay for us.” They stood there, rocking in each other’s arms, for a while. Talking about the band and the big night. Then, they naturally disentangled and moved towards the bedroom to begin getting ready for bed. “You know what you always say about ‘Louie, Louie’?” Minerva rinsed her toothbrush out, and nanite toothpaste swirled down the drain. As Minerva turned out the lights, she said, “We’d better.” Lying in the dark, Minerva was simply thankful she had two more days to get used to the idea. Would that be enough time to make her ready? It would have to do. She fell asleep running over the plans in her mind for the next two days. Even if she wouldn’t be ready, she could make sure everything else would be. And so, the night before the big day, Minerva and Bomani each swallowed three pills with a flute full of champagne. Then, they retired to their bedroom and got about the business of forgetting each other. Minerva knew that the tighter she clung to her husband, the more fully the Mnerozia would work its way into her memories and erase him. Yet, in her fear to lose him, she clung to him tighter than ever. In a warm haze, Bomani rose from their bed, dressed, and left for Damon and Christy’s where he would spend the night. The drug was already working, and he couldn’t remember why he had to leave for Damon’s in the middle of the night. Except, he knew the big gig was tomorrow, and if he slept on Damon’s couch, he’d be there to help out in the morning. Puzzled, Minerva watched him go. Her confusion didn’t last long. She was asleep in mere minutes. Christy called in the morning to remind Minerva they had plans together that night. Something at Kenny’s coffee shop. She’d come over around three, so they could get ready for it. Pick out dresses. That kind of thing. Minerva agreed and, at Christy’s suggestion, spent the intervening time working in her garden. It was a good suggestion — the house felt strange today. The garden, however, was the same as always. While Minerva spent the morning feeling oddly empty, Bomani didn’t miss her at all. Damon and Bomani hung out at Groundswell Coffee all afternoon. They pretended to fiddle with the sound equipment, but they were really watching the people come and go. Of course, a customer that came in for coffee at two wasn’t going to stay for a performance at five. Nonetheless, Bomani’s heart stopped every time a potential fan walked out the door. And it was a big success. Bomani, Damon, and Jack, Revival’s drummer, played like their instruments were on fire. They owned the stage. Energy in the crowd reverberated with the energy in the band, pushing their performance to an ecstatic level. Every song ended to an eruption of applause. Sitting quietly at a table in the back, Minerva and Christy were lost in the music. Even without the aid of the Mnerozia, it was very much the mirror of the night Minerva and Bomani met. Of course, Damon wasn’t the bass player back then; Bomani had been in an entirely different band. And, Minerva didn’t meet Christy until she took her current job. Still, the two friends had been briefed and knew their roles. So, when the first set ended, Damon led Bomani through the rapturous crowd, back to their wives’ table. “Hey love,” Damon said, kissing his wife, playing it cool as the new rockstar. “Hi Christy. How’d you like the set?” Bomani asked, proud as a peacock. The crowd was settling down. Dancers, jumpers, and screamers slowly morphed into normal coffee-drinkers carrying on quiet conversations. Damon sat down beside Christy, and Bomani joined them. The four individuals, who were usually two couples, sat around the small round table, and the tension grew. Damon ordered himself a drink, and Christy wondered what she’d gotten herself into. At the height of awkwardness, as if on cue, Bomani grabbed a handful of sugar packets. “I can juggle,” he said and threw the sugar in the air. Christy’s breath caught in her throat, and Damon spat out the word “Fool!” But, one packet at a time, the sugar landed in his hands and sprang back in the air. Minerva’s face broke into a grin. She already thought this gawky guitarist with a black face and bright teeth was cute. She admired a middle-aged man who was still following a dream. As she put her hands together to applaud the juggling, the dancing sugar lost its feet. Packets went flying, and Bomani reached to stop them, knocking Minerva’s hot chocolate in her lap. She laughed and laughed. “I’m so sorry…” Bomani took a napkin and tried to wipe the hot chocolate away. “So sorry.” But Minerva was still laughing, and her laughter made him grin. You know, Bomani thought, this girl didn’t look half bad. With her face lit up like that — she was pretty. Bomani measured that answer and liked it. “I’m a tech at Ent-Ind,” he said. The chair levered back to sitting on all fours. Bomani wasn’t sure he wanted to talk about Ent-Ind. He opened his mouth to speak, but it took a moment for the words to form. “Yeah, uh, you could say that.” He turned to Damon, as if looking for an out. However, Damon was showing Christy the lineup for the next set. Minerva scrunched her eyebrows, confused. “I get the recordings of the singer’s voices, the dancer’s movement, that kind of thing. Then, I match up faces, styles of expression, tone of voice, musical beat — all those things — I put them together, trying different combinations, until I get a real blend.” By now, Bomani’s hands were moving with his words, and he’d leaned forward in his chair. “I guess it does take some artistry,” said Bomani, suddenly acquiring a modicum of modesty. He knew he’d been boasting, in his heart if not his words. He felt like a puffed up rooster tonight. And for all his qualms about it, he loved his job. Whether it was right or not, he enjoyed doing it. Bomani looked at her quizzically. “Well…” Damon started, but Bomani cut him off. “An Ent-Ind artist can’t perform in public, because he’s licensed his talent to Entertainment Industries. It’s not his anymore. But, that’d be okay. If that were the only thing. Here’s the real killer: they lock the artists up in isolated studios when they work. Actors don’t act together. Dancers don’t dance together. And bands never play together. “Hear, hear!” Damon cheered and raised his drink. But the women both looked a little shocked. Eventually, Christy shrugged. “It’s a good thing you both like your day jobs,” she said. “‘Cause, you’ll never support yourselves at it this way.” She gestured to the crowd around them. The men rose from their seats. They could see Jack beckoning them to the stage. The crowd was crackling with anticipation, but all Bomani could think about was that he seemed to have upset Christy’s friend Minerva. “Shall the four of us get together for a late dinner after the second set?” he asked. He was sure he could patch it up then. His views could come on a little strong… But, this woman looked like she could understand him. With time. Bomani had turned around and was watching now, but Minerva didn’t care. She didn’t know this man, so what did she care what he thought? He sounded like he needed a severe talking to, and she felt like the person to do it. Though, she didn’t know where the feeling was coming from. Christy wanted to defend Minerva’s husband, but she knew that the first song of the second set was “Louie, Louie.” She looked down at the tabletop, avoiding the wrath in Minerva’s eyes and the hurt in Bomani’s. “Let’s get out of here,” she said. That wasn’t part of the plan, but right now her priority was damage control. Minerva and Bomani would get over this fight, but, if Revival didn’t get back on the stage, Kenny might not ask them back. Christy’s worries about the band, however, were completely unfounded. Revival was an unequivocal success, and Kenny invited them to play Friday and Saturday nights at Groundswell indefinitely. The band had a late dinner together to celebrate. Damon and Jack crowed about their coup. Bomani tried to join in, but his heart wasn’t in it. After all their work for this success, all he wanted to talk about was that girl with Christy. He slept on Damon and Christy’s couch again that night. Christy stayed over with Minerva. The two women looked at old photo albums and talked about the good times Minerva’d had with Bomani until her memories were almost entirely back. She swore she’d never take that damn drug again. Time heals all ills, or so they say. Neither spouse, however, wanted to wait for time. By arrangement, they met at Kenny’s coffee shop the next morning. After the late night net-buzz about Revival, Groundswell was the place to be on a bright Sunday morning. They would have had trouble finding seats, but Kenny had heard what happened and held a table for them. Over coffee and croissants, they looked at each other. Nervously. Until the last drops and crumbs were gone, neither ventured to speak. Bomani kept a stiff upper lip, and Minerva kept letting her hair fall in front of her face. She felt shy. Their hundred-and-twentieth anniversary hadn’t turned out to be a second enchanted evening, but this morning felt as awkward as a first date. And, honestly, she felt guilty. For the things she’d said. Worse, for knowing she’d meant them. Also, she felt sad. She’d ended up missing out on Revival’s big opening, just as she had feared. There was a quaver in his voice, and it broke Minerva’s heart. Between the band and their anniversary, this should have been a happy day… The contrast with what “should have been” only made it worse. Minerva was out of her seat and in Bomani’s arms within seconds. She heaved dry sobs, pressed against his stiff chest, unyielding arms. She buried her face in the curve of his neck, fighting off hot tears. For all his nervousness, his vulnerability, his hurt pride… Bomani couldn’t resist that. He pulled her hands from cradling his face and held them in his lap. “I’m too old to change,” he said, and he looked old as he said it. “I don’t want you to,” she said. “But you hate it… the perennial sixties music… the…” he would have continued the list, but it made Minerva cringe. That knocked the wind out of her, because she knew it was true. “Well, you’re a saint,” she said. “To me. And, that’s why I forgive you for everything else that’s wrong about you.” Minerva sat back in her chair, fiddled with the dishes. How did she ever deserve a man like him? And yet… She couldn’t help remembering how he’d looked to her the night before. She’d seen him with unbiased eyes, and she hadn’t liked what she’d seen. Or was unfamiliarity a bias too? Of course, it wasn’t the night she regretted so much as what she’d learned. Bomani had grown into a middle-aged sell-out, and she’d become a judgmental woman capable of despising him. She would have to choose not to. And she would have to live with the knowledge.